When the Beck Motor Company in Pierre SD heard about local five-month old twins who were diagnosed with leukemia, owner Trace Beck wanted to help. “There was already a Kickstarter campaign in place, but I wanted to do more,” said Beck. That's when Beck discovered mobile fundraising with Give by Cell. And help he did, raising more than $21,000 in under four hours and far exceeding the original goal of $5,000. Beck Motor Company held a one-day fundraiser at the dealership on September 12, 2015 offering free oil changes and car washes for donations. They turned to Give by Cell to help collect credit card donations using mobile phones in addition to the on-site cash donations. 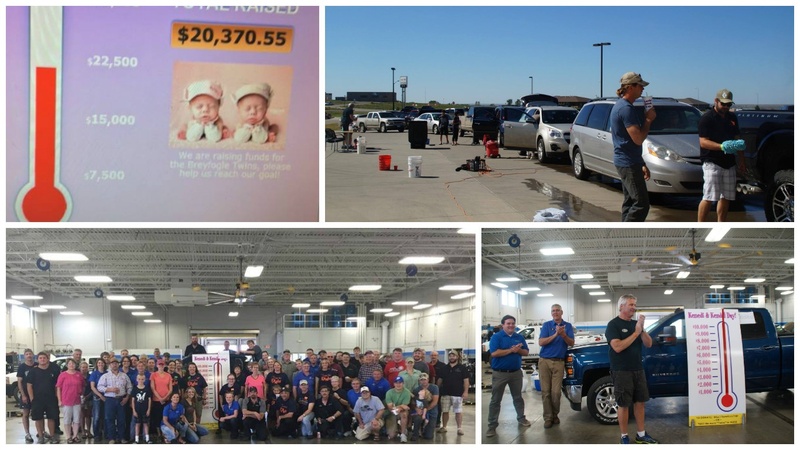 During the 4 hour event, Beck reports they did over 90 oil changes and a couple hundred car washes.The fundraiser far exceeded the $5k goal, raising $21,000 for the twins’ medical expenses. “We used the Give By Cell system to collect donations from people that did not have a checkbook with them, and as you can tell it worked out very well," said Beck.